Mobilize your Web Site - Mofuse, Mippin, and Blogger too! Before I had my newborn, I would often take the train and bus into work, and I would use my Droid X smartphone to surf the web. Despite a speedy 3G connection, I appreciated websites that had a mobile version so I could get right to the content and bypass any irrelevant sidebars, videos, or other navigational tools. 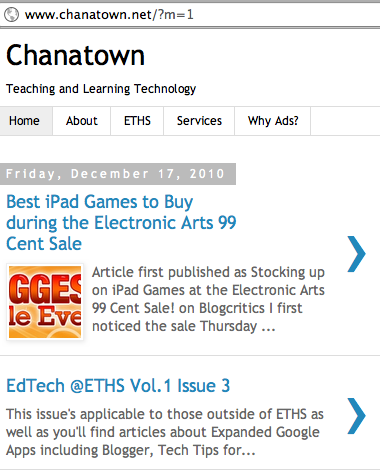 I felt the same should be true for this very site, so I began investigating options for mobilizing Chanatown. Just when I thought I had a winner, guess who stepped in with the easiest and best solution of them all? Find out after the jump. Mobify: I found this to be the most complicated, but this also means that Mobify is the most customizable. 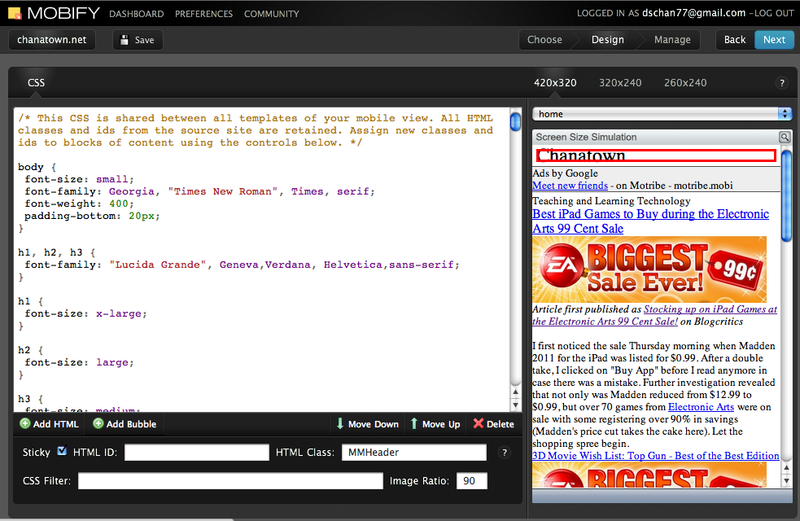 Upon signing in, users are greeted with a CSS editor with a live preview, and content can be managed as blocks. You can set up various templates, as well as preview different sized mobile screens. Once live, you have a customized web address that ended in mobify.me. If you're on a mobile device now, check out chanatown.mobify.me, though be warned, I have not made any significant edits to the format/style for close to a month. Mippin: Instead, I focused on using Mippin Mobilizer. Rather that needing to set up the styling of my mobile site, I was able to rely on the automatic mobilization feature found with Mippin. All I needed to do was submit the URL and/or RSS feed, and my mobile site was created. Contrary to Mobify, there was no new site redirct for the Mobile version, so I placed a link to the site on my main webpage. See the mobile version using Mippin here. On one hand, Mippin does a great job of stripping down to the main content (the posts). On the other hand, a downside is that the tool only shows a limited number of posts, and archives are not searchable. Blogger Mobile Beta: Just when I was ready to publish this post, I receive a popup message on my Blogger dashboard. It turns out that Blogger is beta testing a mobilizing feature for its blogs. Quicker than you can say "instant mobilize," I had a very elegant solution to the mobile website conundrum. Similar to Mippin, I was limited a bit to the number of posts displayed on a page, and there was no search option. However, the page tabs were available, older posts were accessible, and mobile Adsense was enabled. If you are a Blogger user, I highly recommend using the beta feature. For those on other platforms (Wordpress does have an automatically enabled mobile site feature), I recommend checking out 1) Mippin if you want a simple solution, 2) Mobify if you are interested in being able to customize and are comfortable with CSS editors, or 3) Instant Mobilizer for an all-in-one solution for your website. For more thoughts on Technology, please consider subscribing to the RSS feed or through email.